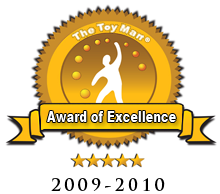 aaabbb The Toy Man® 2019 News & Reviews - "It's about a whole lot more than just toys!" One of the most "unusual" products ever to be with inducted into The Toy Man� Product Guide is this crazy game called Triviathon. You had better be ready because this game is a guaranteed barrel of laughs...err no, I would rather say a truckload of laughs! 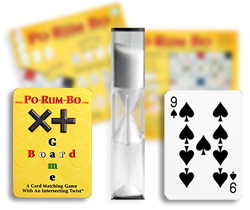 Po-Rum-Bo is a combination of Poker & Rummy played on a Game Board. Using playing cards from all four playing card suits, players place them criss-cross, either �across� or �down� on a game board with bonus squares. You earn points with every play of the game based on the cards played, the hands created and the board bonus squares used. 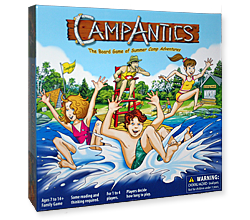 The board game of summer camp adventures. Once around the board, is one very realistic day at summer camp. Lots of Mischief, Activities, and Announcements keep all players interest and involved, even if it is not their turn. 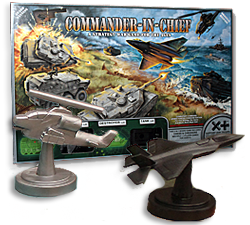 Commander-In-Chief is a fun fast playing abstract strategy war board game in which a player�s military vehicles work together to �capture� their opponent�s Commander while simultaneously defending their own. Commander-In-Chief is a 2 � 4 player combination of Chess & Checkers with an Air, Land & Sea military theme. 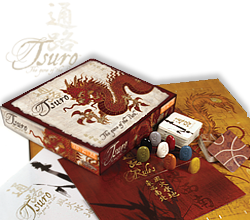 Tsuro - The Game Of The Path is a tile laying game where the tiles show paths and on your turn you must lay a tile next to your stone. 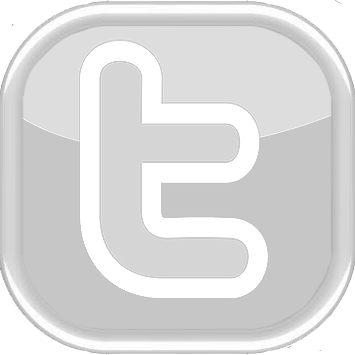 If the path leads you into another person�s stone or off the board you lose. The last player on the board wins! BANANAGRAMS� is a fast and fun anagram game that drives players bananas! 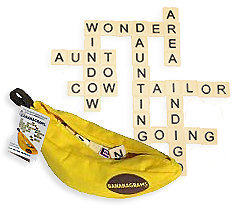 Requiring no pencil, paper or board, Bananagrams comes in a small portable banana shaped pouch and is perfect fun for kids from 7 � 97 years-old, at home or on the go. Neff Headwear Fold Heather beanie, heather-dyed fold design in a wide variety of fun colors. Made from extra soft 100% acrylic material and a cozy ribbed knit, you won�t wanna take this one off. 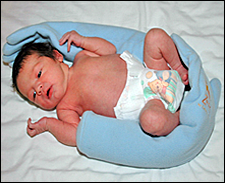 PUCKABABY� BAG NEWBORN is a fantastic sleeping bag for your baby or expected child. 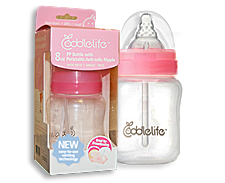 It regulates your little one�s temperature and shields from cold and drafts. The sleeping bag is soft, with luxury finish, and it even has anti-scratch mittens. Like all Neff Headwear products, the Character Mitts do more than serve the purpose of keeping your hands warm, they make a statement about you. They represent style and that added kick that says they are just totally cool. 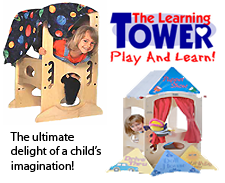 The Learning Tower provides a safe platform for your child to work on projects at countertop levels. Sturdy and durable, it is constructed from wood and is protected with a gloss finish. 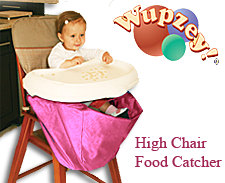 Adjustable to three levels, it will grow with your child! Lay-n-Go is an award winning (patent pending) activity mats, cleanup, carryall and storage solution in one for families both at home and on-the-go! Small toy collections are easily spread out, contained, and cleaned up at home, while visiting friends, in restaurants, on airplanes, in cars, at Grandma�s house, or wherever life takes you. The award winning "strap-free" BabySmart Cooshee HyBak seat props-a-tot up and forward for focus and concentration! With a contoured wide-angle base, skid-resistant circle-pods, side arms to prevent leaning over, leg-positioning for proper posture, and a snug higher-back design. 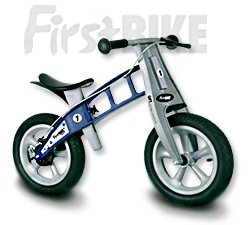 The FirstBIKE� is the perfect training bike for developing your child. 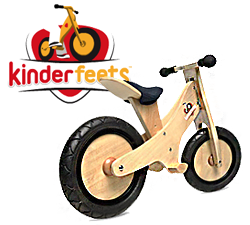 As an added plus, some�models of the�FirstBIKE� Balance Training Bikes�have the luxury of a precise rear drum brake that provides an added level of safety during use. The fun learning activities focus on language, cognitive, social-emotional, and physical skills. All of the Brain Insights information is provided in everyday language. Adora Toddler Time Dolls can turn a frown upside down, build friendships, teach nurturing, bring comfort and turn a boring day into a day of play! 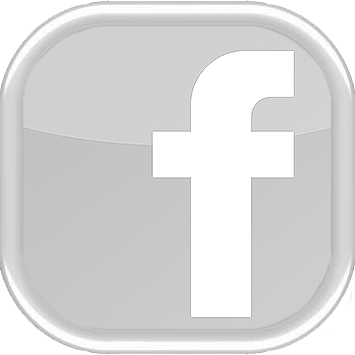 That�s what makes Adora Dolls special�oh, and we can�t forget those adorable baby faces�squeezable, loveable, cuddly, cute�simply irresistible. Alphabotz Superphonic Decoder Cards are educational cards that help jump start beginning reading skills by helping early readers build lasting associations between sounds and the letters that represent them. Just imagine luscious looking ice cream treats in front of you. Hmm, bright colors with an enticing look which is so tempting to pick them up. The Construction Plate is starting off with being quite unique and Made in the USA. 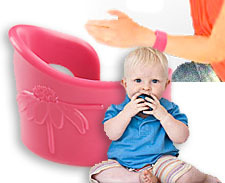 It has patented features that work with some special utensils, ( which are also available separate ) to make eating fun and easier for children. The Snack and Play� Travel Tray 2.0 is packed with all kinds of options for a child to entertain themselves while in their car seat, stroller or even in a shopping basket!. It has a dry erase electronic safe magnetic surface that allows children to play with dry erase markers, magnetic toys, or just eat their snacks. 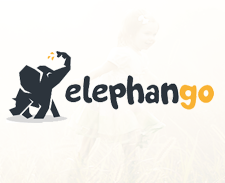 Elephango has established a new standard in online education resources that are vital to cognitive development in a child. A child begins a never ending journey as they are captured by their first learning content which in turn stimulates their desire to follow a seemingly never ending wealth of source of new topics of content to read. Created by a developmental psychologist, BabyPlus is a patented, early curriculum and prenatal education system that introduces patterns of sound to a prenatal child in the one language they can understand�the maternal heartbeat. Moo is a blue-and-white cow born to a black-and-white pasture in CowTown, USA. Rather than look at that as a deficit, Moo realizes that there must be more to life than eating grass. So she leaves in search of fun, friendship and really good food. Life is but a game for a baby when they are in the newborn to 6 months age range. For an infant, the design and image pairings with eye games for baby become part of a fascinating game so to speak, of venturing, learning, and visual stimulation. Help Me Thrive While I�m Five provides 40 insightful activity ideas for you to promote learning and bring smiles throughout everyday life! The activities are designed for delivering the fun and Neuro-Nurturing your five year old needs even when you are busy. Love Your Baby emphasizes the importance of attachment for healthy social/emotional and cognitive development. The brain development information is explained in everyday language. 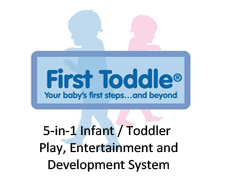 This packet assists new parents in the providing child development for their new baby and does it in an easy and unique format. The Greatest Dot-to-Dot Super Challenge books 5-8 provide a whole new level of challenge and intrigue. The "Arrow" and "Compass" puzzles provide unique methods for connecting points to reveal a picture. Other new puzzle designs include Alpha Dots and ABC Sets as well as double page spreads with over 1,400 dots and more! SABU & ME is a perfect example of what occurs when parents give their children the attention they deserve and recognition to their developing skills. Written by Maura herself, the book is a re-telling of her earliest memories with her best friend, her dog Sabu. ArtObet: A Magical Adventure of Artists! 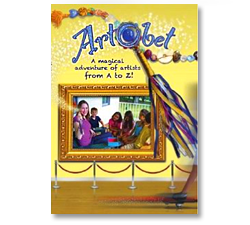 Artobet is ideal for ages 3-8, but with engaging stories, beautiful imagery, fun animations, relaxing period music, easy-to-chant poems that help children understand each artist, and cameo appearances by the tooth fairy, cookie bandit and George Washington, it is a film the whole family can enjoy. 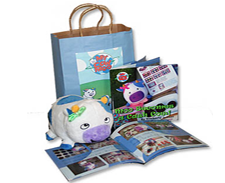 Introducing the Early Lingo Colors and Shapes in The Park - Chinese Edition DVD. It is the first of its kind, offering 12 animated and live-action videos to teach a child the basic foundation of a foreign language; in this case, Chinese. 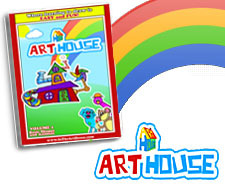 Simple and direct, just as a child for this age group is how one would describe the content of Arthouse - Volume 1: Basic Shapes and Animals. 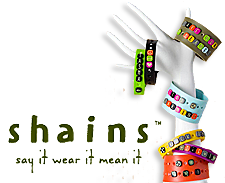 A colorful collection of content that assures improvement and development. This DVD in Numbers and Counting teaches young children to count from 1 to 10 by way of engaging classical music, photographs, and video. Each number is presented with photographs, video, and animation. 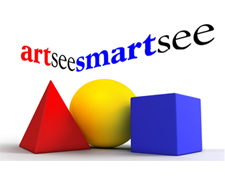 by an Emmy winning designer, artsee smartsee contains a 30-minute movie of animated high contrast objects and shapes choreographed and finely timed to a mix of 24 popular classical recordings. Introducing the Early Lingo Numbers & Counting At The Farm - French Edition DVD. It is the first of its kind, offering 12 animated and live-action videos to teach a child the basic foundation of a foreign language; in this case, French. Sight words flash cards decks each contain 100+ of the most frequently used words that do not necessarily follow phonetic rules. They cover up to 75% of the words found in beginning books. Learning to automatically recognize these words without decoding them greatly increases your child's reading speed accuracy, fluency, and comprehension. �Dinosaur Days� takes you back to the Jurassic period in time. You can help the Brachiosaurus reach the leaves of a tall tree, swim in ocean with the Plesiosaurus, or even hunt the Triceratops with the Tyrannosaurus Rex. Kids will love this wonderfully crafted storyboard. The WorryWoo Monsters is a first-of-a-kind series of books and plush dolls where emotions come to life as lovable, quirky characters. Each story follows a WorryWoo monster through a whimsical journey to self-awareness as they confront their representative emotion. 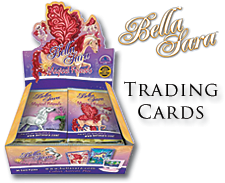 Bella Sara is a unique combination of collectable horse-themed trading cards and a magical online world for kids at BellaSara. Each Bella Sara trading card features a fairytale-like illustration of a horse along with a positive message such as "Beauty comes from within..." or "Be the hero in your own story...", designed to stimulate pro-social dialogue among kids, and between kids, their parents and educators. 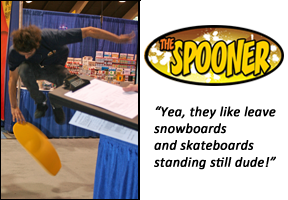 Unlike a traditional skateboard, which requires large spaces, or a snowboard which requires winter conditions, the Spooner allows users to practice all the techniques of both sports in a space no larger than a 4-foot cubicle. The new home console is unique in that it�s not just a home console: It�s also a handheld. The Switch can either sit in a dock and connect to a TV for some traditional play, or players can take it on the go and use the tablet-like system�s own screen as their main display. Sony PS4 Pro Console - 4K TV Gaming and More! If you are a serious gamer like myself, speed and detail are major concerns about your gameplay. Let the super-charged PS4 Pro lead the way to fulfilling the heavy demands of the serious gamer. PS4 Console - Got Game? The Sony PS4 Gaming console has managed to establish itself as a virtual addiction to gamers as the most popular home console across the US. It has a serious load of entertainment features including VR support. Play the greatest games lineup on a smaller console. Just don't try and be a one man show; the game requires team effort to achieve completion of your orders. Resident Evil 2 is a survival horror game developed and published by Capcom. Players control police officer Leon S. Kennedy and college student Claire Redfield as they attempt to escape from Raccoon City during a zombie apocalypse. Dragons, long lost to the passages of the Elder Scrolls, have returned and the future of Skyrim hangs in the balance. As Dragonborn, the prophesized hero born with the power of The Voice, you are the only one who can stand against them. After eight years behind the mask, Peter Parker is a crime-fighting master. Feel the full power of a more experienced Spider-Man with improvisational combat, dynamic acrobatics, fluid urban traversal, and environmental interactions. A rookie no longer, this is the most masterful Spider-Man you�ve ever played. 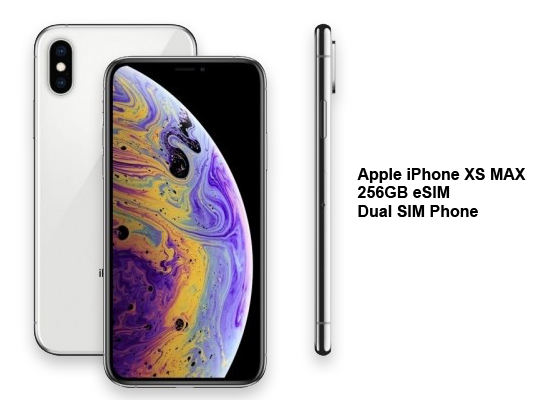 6" long and 3" wide, the LG V40 ThinQ serves to re-define the term "Phablet"! With 5 cameras, Android OS and a full treasure chest of features that's practically overloaded, the LG V40 ThinQ scores the winning point with buyers. Introducing the iPhone 4S. The dual-core A5 chip delivers even more power. The 8MP camera with all-new optics also shoots 1080p HD video. And if there is anything else you need, just ask Siri. Best of all, no matter what others may say, the battery life performs as promised! With a 12.9 all-screen design, the iPad Pro is a masterpiece of design that does everything you need,flswlessly. It is a powerhouse of delight with an A12X bionic chip. Face ID. liquid retina display, a neural engine, Smart Keyboard folio and augmented reality. Jishaku� is a patent-pending, portable strategy game like chess or checkers that can be played anywhere � the kitchen or the beach. But unlike chess, there is an element of surprise when the magnets jump out of position, without warning. There is no predicting what will happen from one moment to the next when playing Jishaku. 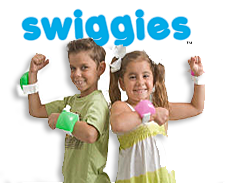 U.S.A. Not for children ages 7 and under due to choking hazard. All applicable magnet warnings provided. Jishaku� is a patent-pending, strategy game like chess or checkers except that it has an additional feature that takes it one step further, and it can be played virtually anywhere. Now that may not push your WOW! button yet, but unlike chess, there is an element of surprise when the magnets of the game jump out of position, without warning! You can rest assured of one thing for sure with Jishaku�. First comes the element of surprise, and then plenty of laughs are to follow as two or more players try to beat force fields with strategic thinking and with careful and precise handling of the game�s magnetic stones. The hilarious unpredictability of the game adds an entirely new dimension to play. The amazing aspect of the game is it's ability to bring families and generations together, revitalizing family game nights once again! "Jishaku" is the Japanese word for magnet. 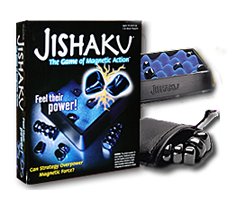 The game "Jishaku", uses finely polished hematite magnets for playing pieces. There are a number of variations in the playing of the game which adds even greater intrigue and assurance of repetitive game play. While alternating turns with your opponent(s), the goal of the game is to place magnets onto the game base - without letting any magnets connect. Now don't think that this task is an easy one, because it's as though the game pieces have a mind of their own. marked, you have no idea of the orientation of the magnet's poles. So as you carefully place your magnet in a hole you can feel the tug of other magnets all around the board. This is where the more skilled players learn to use magnetic force in their favor, repelling the magnets closest to them without forcing them into other magnets. Strategy takes on a whole new meaning in game play. There is no question about it - Jishaku has an edge on checkers and chess like never imagined. With both checkers and chess, there is a high probability that people will learn the majority of moves and counter-moves to win a game. checkers and chess both have a logical progression of probabilities in sequence of moves. This is not the same with Jishaku. Due to the fact of the magnetic poles with each game piece, there is no absolute method of planning a strategy that will work every time. The odds of playing the same game twice are literally next to none. This ensures a much higher level of repetitive play with Jishaku, well beyond that of checkers and chess. Jishaku is to say the very least, a unique game which sets it apart from most others with its magnetic attraction. Considering that very fact, we decided to call upon the services of a well known doctor who has published several books, well known for his studies and accomplishments in homeopathic medicine, as our first product evaluator. This doctor brought some amazing information to light in reference to the game which we are sure our readers will find of keen interest. "This game was well beyond the level of what I was expecting during my initial visual impression. I had assumed it to be just another hopeful imitation with yet another variation on a design which was previously developed. After careful evaluation and study, I concluded that this game is a serious potential rival to the current strategy games available in the retail market when looking at it from a game play perspective." "From the medical perspective of the game, Jishaku delivers a natural positive effect that may not even have been intended at the time of its inception. Our blood system has iron within the blood. When the blood is exposed to a magnetic field of the proper type, the exposure stimulates the blood system and encourages a greater level of healing. I use this type of therapy in my own practice today. To help you understand the full value of the these hematite stones, I will provide a brief definition for you which you can share with your readers should you decide to do so. Hematite is an iron oxide, metallic, opaque stone which is generally found in iron-mining areas. These are a few Hematite varieties, such as iron luster, red iron ore, red ironstone and red glass head. Color varies from black, black-gray, to brown-red. It is believed that Hematite gathers and calms natural energies and ensures the wearer alertness, vivacity, and success in litigation. Many of the attorneys I work with from time to time tell me that the hematite stones are an absolute must when they are in court. 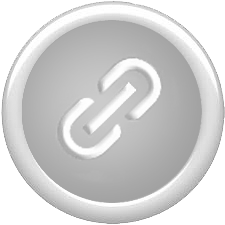 Although the level of magnetism from the Hematite magnets is of minimal effect upon the human body during game play, it undoubtedly will have a positive cumulative effect to an extent. Take this fact into consideration, merge it with the action of the game play, and a compelling argument can be formulated. This argument would be founded upon whether or not the Jishaku game does in fact also serve a homeopathic benefit as well as be a great strategy game." "This game serves as a wonderful tool for general play while at the same time providing a strong contribution to a wide range of developmental skills with children. For adults, the game contributes to a refinement in their current mental and simple motor skills. What you have here is a game which requires a greater level of exercise of creative thinking and strategic planning. For some, the game play may sometimes become exasperating with the unexpected movements of the playing pieces. At the same time, it stirs their emotion, instinct, and self-esteem to face the challenge of the unexpected and beat it. The design of this game is masterpiece of challenge. Having a play structure which is virtually never played the same way twice, it stimulates the desire to play the game with multiple repetitions. With each repetitive game, further refinement of skills is achieved with a productive end result while having fun simultaneously. With the excellent combination of color, shape, and challenge, this game is one which would be suitable for both the general retail market and at the same time, function well as an application for contemporary Special Educational Needs/Behavioral Disorders treatment. A final point I will make in this report is my feedback after reviewing the videotapes of the consumer evaluation and the staff evaluation. I was literally enthralled with the response level of each individual while playing the game. No matter what the ethnic heritage, age, or financial standing of the players, they all demonstrated a quite aggressive level of response in reaction to the game play. This strong level of response validates my prior opinion of the positive impact on the players." Consumers have no hesitation in telling you what they think of a product when given the opportunity, and it isn't always what you desire to hear. This being the case, performing random hands-on consumer evaluations of products really tells you a lot. These are the REAL opinions that let you know just how good a product really is and if need be, how to improve upon it. In this evaluation segment, we visited a major mall in Las Vegas, NV. We brought Jishaku along with a variety of other new products for consumers to get an opportunity to get hands-on experience with. 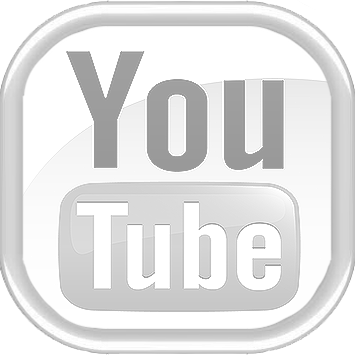 In our normal procedure of hands-on evaluation, we always videotape the evaluation by the consumers as well as capture candid shots of the evaluation participants playing with a game, toy, or wearing a product. To our surprise this time, all of the participants refused to allow any photos to be taken and wanted assurance that no one outside of our staff would be able to view our videotapes of their participation. This posed an unusual position for us that we had not encountered before, but we have to respect the wishes of our evaluation participants. All of the products we brought for the hands-on evaluation received rave reviews from our participants, but Jishaku was over the top! Watching the people playing Jishaku was like watching a comedy show; plenty of laughs and even more unexpected moments! Never have we seen so many people having so much fun, again and again. A primary point of interest was that no participant played the game only once. As one of the evaluation participants stated to us, "This game reminds me of that Lay's potato chip commercial where it says, 'I'll bet you can't eat just one!' With this game, it should be, 'I'll bet you can't play it just once!' It's just too darned addictive!" That statement was soon to be a resounding statement of truth by everyone playing the game. I personally asked a young lady to tell me what she found so she liked the best about Jishaku. Her reply was, "I am fascinated how those little stones keep moving when you least expect them to. You never know what to expect next!" It appears that virtually every person playing the game was of the same feeling, being drawn to play again and again. There was no question about Jishaku being the favorite product out of the entire group of products we brought for hands-on evaluation. The participants had so much to say about this game that many of them even wrote on the back of the form to include everything they wanted to express! Jishaku was a sure sell based on this portion of our evaluation. While other organizations will define their ratings in a "blanket" method which simply defines each rating in an overall usage, we choose to take a different approach. 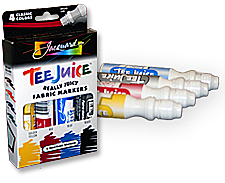 Each individual rating that was assigned to this product, is based upon a combination of our evaluation guidelines and consumer hands-on evaluation feedback. The information below provides a brief explanation as to how that specific rating score was reached. 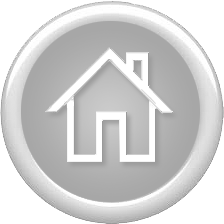 The individual category ratings for this product are listed below. CRITICAL SKILLS DEVELOPMENT: Rating Level 5 - When it comes to critical skills development, Jishaku proved itself more than qualified to receive recognition. The more kids and adults are playing the game, the greater the level of stimulation to their critical/cognitive skills and thinking processes. Strategic thinking is synonymous with this game. Although critical skill development is already well established for the age group for which this game was designed, there is always a need for further stimulation and improvement. Jishaku is instrumental in helping players develop a far greater level of speed in analytical processes, stimulating motor & cognitive skills, improving thought process, and tactile touch recognition. Jishaku provides a substantial contribution to critical/cognitive skill development in children and helping adults knock the dust off their brain cells. EDUCATIONAL VALUE: Rating Level 3 - The educational value for Jishaku was an average score of "3" in this category. Although Jishaku excels in most other evaluation category scores, when it comes to the educational value, it was difficult to determine any substantial contribution by this game to the educational realm for a child or adults. The scoring for the educational value was reached primarily from the contribution to strategic skill development and thought processes. Jishaku pulled an average score of "3" in this category. 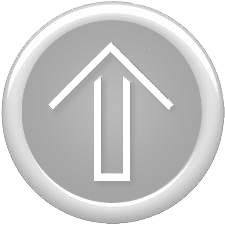 FUNFACTOR�: Rating Level 5 - FunFactor� was as simple as can be in determining with Jishaku. Every participant who played Jishaku, demonstrated that the level of FunFactor� in this game was of the highest level in regard to FunFactor�. Combining the facts of every single participant demonstrating a very strong response level to the challenge of the game, our videotape evaluation, and the feedback in our product evaluation feedback forms, it was easy to establish that Jishaku scored the highest possible in this category. Jishaku pulled a perfect score in this category. INNOVATION: Rating Level 5 - Jishaku was by far one of the most innovative ideas in game design we have seen to date. Using Hematite stones with their magnetic properties delivers a challenging game of strategy which delivers game play which is virtually never repeated. The combination of the game rules, game pieces, and overall concept of the game, truly defines what the word "innovation" is all about. MARKETING VALUE: Rating Level 5 - The marketing value of Jishaku couldn't possibly have been any higher. 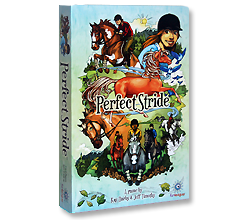 It is a simple game that is popular, well designed, and has an excellent price point. The level of popularity was all too apparent from our video tapes, feedback forms, and our own visual impression. 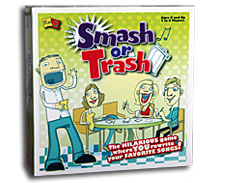 What you have here is a game which will be an easy sell; a most unique and innovative concept in game design which delivers a refreshing concept of game play which encourages repetitive play. Being so unique and capturing the attention of the players so overwhelmingly, Jishaku pulls a perfect score in this category. VISUAL APPEAL: Rating Level 5 - When it comes to visual appeal, Jishaku pulled a perfect score in this category. From the striking colors of the game box to the colorful magnetic Hematite stones used as playing pieces, Jishaku pulled a perfect score in this category. 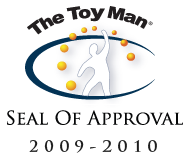 From evaluation for induction into "The Toy Man News & Reviews"
Since 1971 "The Toy Man® Seal of Approval" has served as an emblem and standard for professional recognition of a product or online service having met the globally recognized evaluation standards of The Toy Man® Product Guide. 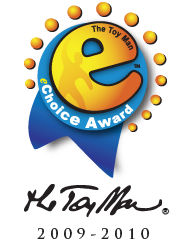 The products and online services which become recipients of "The Toy Man® Award of Excellence" achieved an evaluation category rating average of  Stars, the highest level of rating available on a 1-5 scale evaluation model. The "Evaluation Category Rating Average, ECRA™," is based upon the overall average from all applicable evaluation categories, not just the 6 evaluation categories featured in this evaluation report summary." 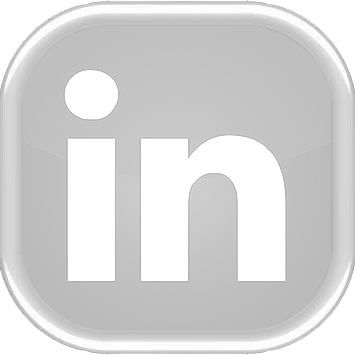 * There are a total of 357 evaluation categories with a minimum of 231 being applicable to any one product or online service.